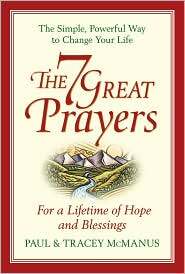 The Seven Great Prayers is a Christian-based book which claims readers of any religious faith can attain material blessings through the power of prayer. The book engages a twenty-one day prayer challenge that goes into effect upon signing a contract with the Divine. The book is designed for Christians, but the authors insist that anyone from any faith can use the book as a template to achieve their financial goals. The chapters are very short, no more than a couple of pages each, and each chapter explains how the power of prayer works in any given situation. Further, the book provides exercises and projects that are easy, and fun to complete. The introductory and first chapters are brief. The introduction, naturally, explains who the authors are, tells the reader how they went from virtual homelessness to prosperity by using the seven prayer principles outlined in the text. The authors go further by explaining why they chose to share this information with the public. The first chapter expands upon the introduction by explaining the author’s desire is to share their blessings with others by teaching the reader how to tap into the power and blessings that God naturally provides. The second chapter is instructs the reader on how to attract blessings in his or her life. The authors assure the reader that God wants to help, wants to bless His children and wants everyone to be prosperous. This chapter tells us how to tap into that divine energy, first by listing and continuing to list one’s blessings, no matter how small they may seem. The chapter also instructs and challenges the reader to change preconceived notions and attitudes about asking God for material blessings. The third chapter is a written spiritual contract between the reader and the Divine. The reader promises to implement the seven prayers into a twenty one day daily program. It is literally a contract that one signs and dates, promising God that the reader will do her or his best to follow the twenty one day program to the letter. The fourth chapter is a simple guide detailing how to implement the seven simple prayers and integrate them into one’s daily practice. The main theme of this chapter involves the concept of living in the present moment, not letting past decisions and bad memories to obstruct one’s progress to success, and not to worry about future events. The authors state that, God resides in the present moment, and it is there that the reader can tap into his or her God given gifts. And finally, the authors remind us to keep a positive attitude no matter how bad things get. The first three chapters of Seven Great Prayers is little more than a sales pitch. The meat of the book doesn’t fully begin until after you sign the contract with yourself. However, once you get past that point the book is not all bad as far as self help books go. In fact, a number of Reiki practitioners will be quite familiar with the topics outlined in the book. Although I am always skeptical of any book that claims you can become fabulously wealthy in under a month’s time, The Seven Great Prayers does contain helpful information that can point you in the right direction. It can indeed be used as a template for spell casting in other formats outside of Christian teachings. And with a little tinkering can work quite well in Wiccan and Pagan spell work. And in these times, every little bit of positive energy helps.